Our "I Love You Bundle" looks just as sweet as it tastes! 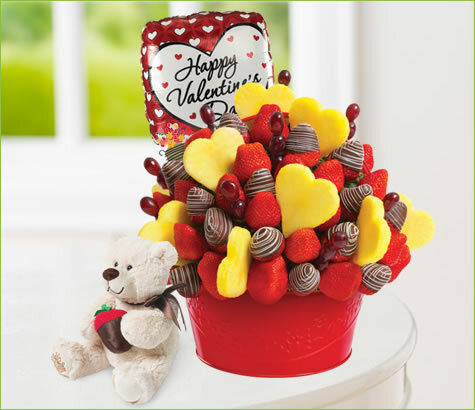 A mouthwatering fruit bouquet filled with hand-dipped, gourmet semisweet chocolate covered strawberries, artfully decorated. It's all arranged in a keepsake, red container Whether you need a gift to say I Love You, Happy Anniversary or Happy Valentine's Day, this is the fruit bouquet of choice. Limited time Offer: Our special Valentine's Day Balloon & fluffy Bear bundled together for twice the fun.